Webmistress Mulcahy | Comments Off on Reserve your conference room! This is a reminder that SUNDAY, DECEMBER 9 is the last day to submit your concurrent session and CMTE proposals for the NER-AMTA conference. Free admission, Free lunch, and open to all! 4. Participants will demonstrate how drumming as a structure for intentional group work within recovery models (II.A.2.g. ; o; q; u; v; ah, an, ao, aw,). 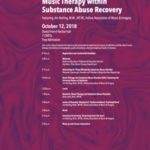 Music Therapy within Substance Abuse Recovery is approved by the Certification Board for Music Therapists (CBMT) for 8 Continuing Music Therapy Education credits. Berklee College of Music #P-161 maintains responsibility for program quality and adherence to CBMT policies and criteria. Cancellation Policy: In the event of cancellation due to unforeseen circumstances, Berklee will make every attempt to reschedule, within 14 days of the original date. 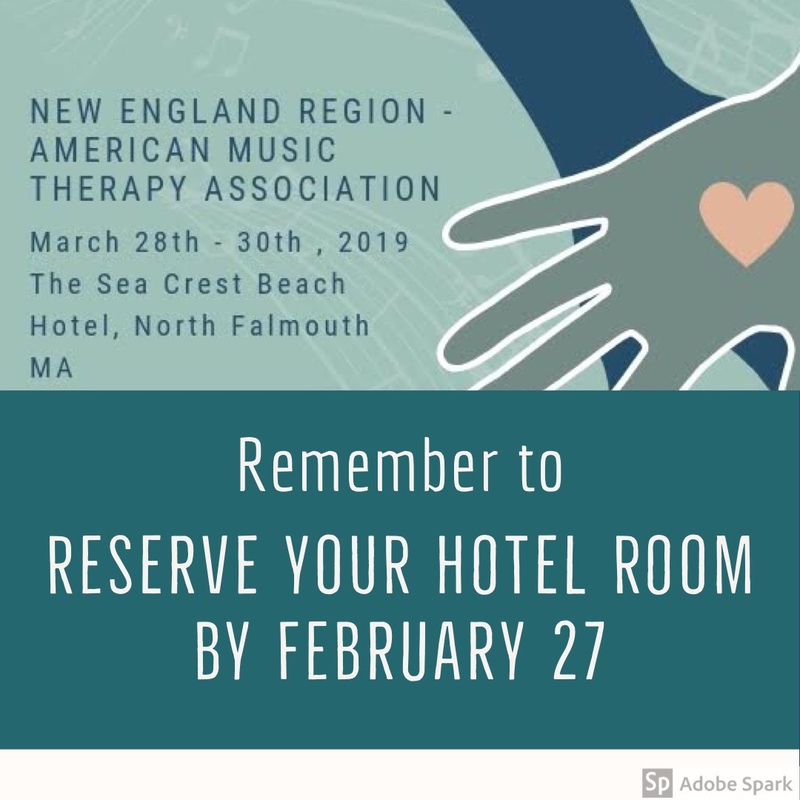 We want to remind you that the call for papers for next year’s annual NER-AMTA conference: 42,000: Embracing Our Impact, at the Sea Crest Beach Hotel in North Falmouth, March 28th – 30th, 2019. Last year we had an amazing turnout of 213 attendees. We compared this information with the results for AMTA’s 2017 workforce survey and surmised that the average NER music therapist sees an estimated 196 clients per year. From this we can estimate that information shared at last years conference has the potential to reach 41,748 clients over the course of the year! This year we are setting a goal to impact the lives of 42,000 clients with the brilliance of our community. Over the next few months, leading up to the 2019 conference, we will be sharing some facts and information about our small but mighty region. We invite you to submit your papers, posters, and CMTEs, to share your practice and your specialties with your community; empowering each other in creation and education to change the lives of our clients. In the 2018 conference evaluation, attendees most frequently reported interest in music centered presentations, technology, neurology, special education, autism, geriatrics, diversity, trauma, and ethics. However, we invite you to also think about the Impact that you make on your clients, and the Impact they make on us when submitting your sessions. All proposals will be reviewed using a double-blind review model. 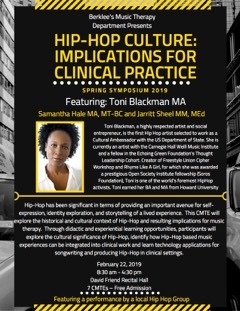 Reviewers will base their considerations on content, clarity, and completeness of the abstract (50%), if the proposal fits within the scope of practice and professional competencies of AMTA and CBMT (25%), and how the proposal meets the needs of our region based upon the 2018 conference evaluations (25%). The last day for submissions is Sunday December 2nd, 2018. We look forward to seeing you March 28th – 30th, 2019 as we focused on expanding our and embracing our impact. We are so excited to announce the call for papers for next year’s annual NER-AMTA conference: 42,000: Embracing Our Impact, at the Sea Crest Beach Hotel in North Falmouth, March 28th – 30th, 2019. Last year we had an amazing turnout of 213 attendees. We compared this information with the results for AMTA’s 2017 workforce survey and surmised that the average NER music therapist sees an estimated 196 clients per year. From this we can estimate that information shared at last years conference has the potential to reach 41,748 clients over the course of the year! This year we are setting a goal to impact the lives of 42,000 clients with the brilliance of our community. Over the next few months, leading up to the 2019 conference, we will be sharing some facts and information about our small but mighty region. We invite you to submit your papers, posters, and CMTE’s, to share your practice and your specialties with your community; empowering each other in creation and education to change the lives of our clients. All proposals will be reviewed using a double-blind review model. Reviewers will base their considerations on content, clarity, and completeness of the abstract (50%), if the proposal fits within the scope of practice and professional competencies of AMTA and CBMT (25%), and how the proposal meets the needs of our region based upon the 2017 conference evaluations (25%). The last day for submissions is Sunday December 2nd 2018. 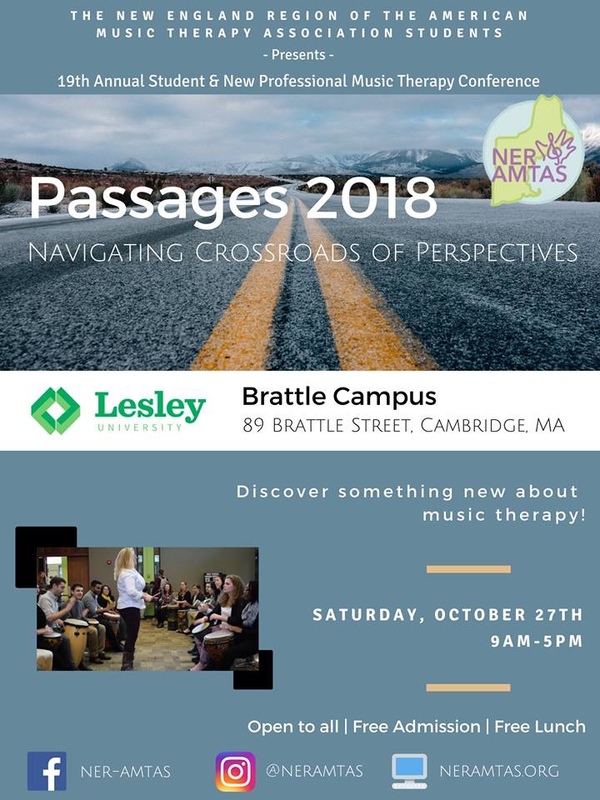 MedRhythms, Inc. is partnering with Spaulding Rehabilitation Network to bring The Academy of Neurologic Music Therapy to Boston for the International Training Institute in Neurologic Music Therapy. This is only the second time that it has ever been offered in Boston – it will fill up quickly, so register today! Individuals are encourag ed to submit content information describing works in progress and/or completed works for Oral Presentation (Paper) or Poster Presentation. Diverse methodologies are encouraged. Submission deadline is June 10, 2018 by 5 pm CST. Authors must submit information as “Paper only”, “Poster Only”, or “Paper or Poster” by indicating preference during the submission process. Researchers are encouraged to submit using the “Paper or Poster” option. Information submitted using this option will be considered and selected for either option by the Research Committee. 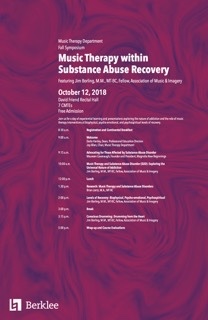 Individual oral papers provide researchers the opportunity to present original work related to music therapy. Presenters will have 15-minutes to present and 5 minutes to answer questions from attendees. 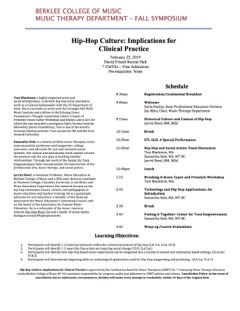 Oral Presentations will be scheduled during a Concurrent Session time block Saturday, November 17 from 11:15am to 12:30pm. The Research Poster Session provides an interactive forum for researchers to discuss their work with conference attendees. The Research Poster Session is Saturday, November 17 from 2:00 to 4:00pm. Presenters will be assigned a location to put up each poster, and posters will be organized by topic as related to MTR 2025 goals. 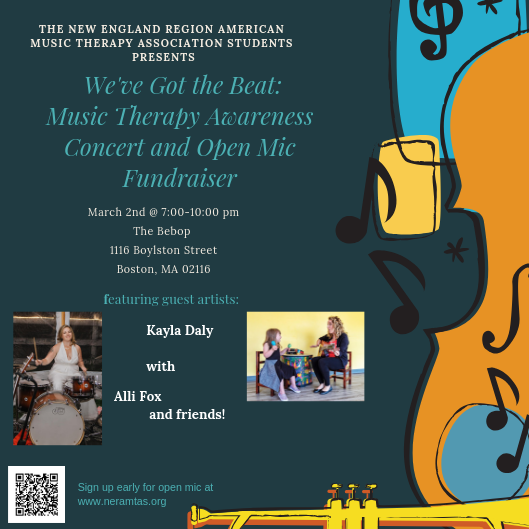 Music therapy students are eligible for best poster awards. 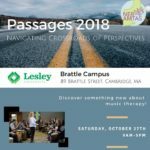 Abstracts will be published in Music Therapy Perspectives. One undergraduate and one graduate submission will be chosen. In order to be considered for this award, indicate in the submission online process if the first author is a music therapy student and what level (undergraduate, masters/masters equivalency, doctoral) and if you wish to be considered for this award. The following bullets will correspond to questions on the online submission process and we ask that you plan accordingly for submission and review by the AMTA Research Committee. 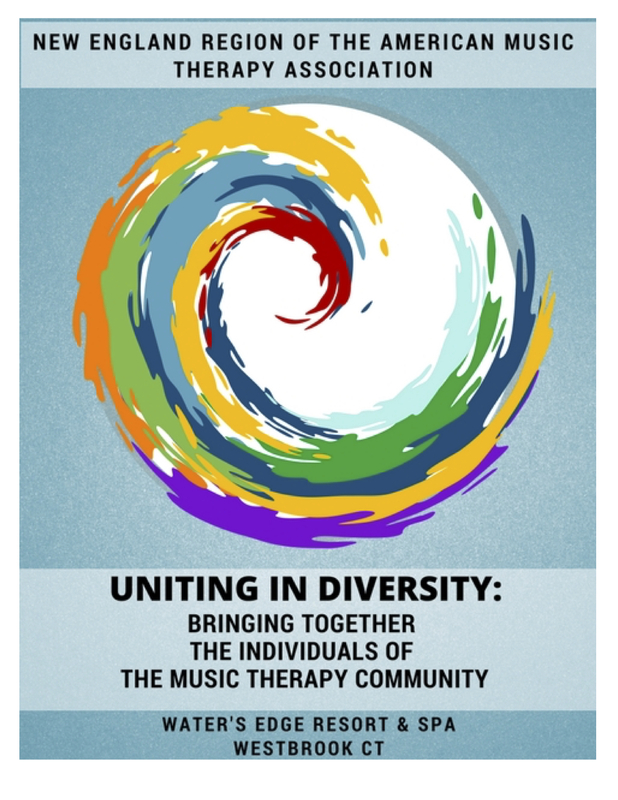 Statement of how the research advances music therapy clinical practice. Each submission must include complete information for judging research quality. The deadline for submissions is JUNE 10, 2018. If, after 5 days of submission you have not received a confirmation of your submission being received contact Cindy Colwell by email at ccolwell@ku.edu or phone (785) 864-9635. After a blind review by the committee, each corresponding author will be notified via email by July 31 of acceptance or rejection of the submission. 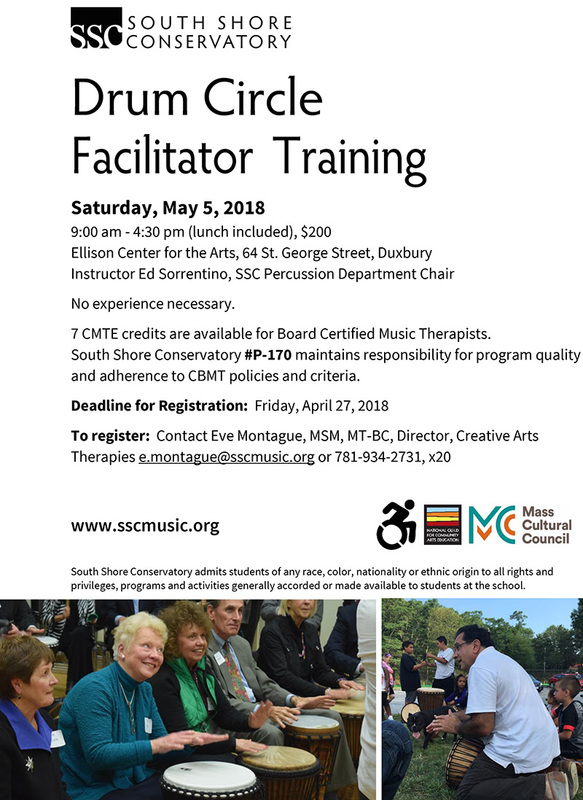 SSC Drum Circle Facilitator Training has been rescheduled because of the recent winter storms. Our training will take place on May 5, 2018. Open to all – no experience necessary. Music Therapists can earn 7 CMTEs for participation. Are you interested in being part of the search for the new AMTA Executive Director? Join the Stakeholder Committee and work together to contribute to a membership survey regarding the desired characteristics of a new Executive Director as well as other tasks outlined by the executive search firm Raffa, Inc.
To ensure membership representation, the Regional Presidents have all been asked to submit one nominee to represent their region, to be part of the Stakeholder Committee. The key role of the Stakeholder Committee Representative is to ensure communication with the membership of the regions regarding the process of the search for the Executive Director. If you would like to be considered for the Stakeholder Committee representative position, please include TWO items: 1) a 50 word biography, required from AMTA 2) a statement of interest. Please send to president@musictherapynewengland.org. All submissions are due 4/4/18. 1) Candidates submit their statement of interest to the NER-AMTA President. 2) The President will review the pool of candidates for each position and select the person that is best suited for the position. 3) The President will then present the name of the nominee to the NER-AMTA Executive Board, along with their statement of interest. 4) The NER-AMTA Executive Board will then vote to affirm the President’s choice for the appointment. If affirmed, the nominee selected is confirmed to the committee/position. If the candidate is not affirmed, the President will again review the pool of candidates and/or continue a search for the person best suited for the position and resubmit a name to the NER-AMTA Board for their approval. To take advantage of the early bird membership discount, please renew your with AMTA membership no later than Friday before noon. This ensure that your membership number is active in our system by Sunday. There will be significant latency in responding to registration issues on Sunday 4/1 due to the holiday.